We are efficiency masters. Our On-Time, In-Full philosophy ensures your needs are met, precisely where and when you specify. We are 100% employee-owned and operated. Our unique, skilled and diverse team have a vested stake in the quality and success of Alpine. We own it, build it, and love it. We are trusted pioneers who thrive with innovation. Since 1963, we’ve helped you build greatness. Our expert care and superior cutting edge products ensure you thrive too. Every moment matters when building greatness. Our 100% employee-owned company lives and thrives on this. 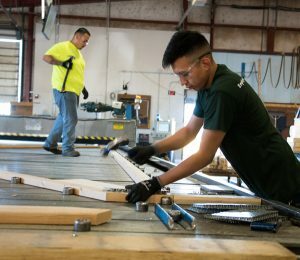 From our 16 uniquely tailored lumberyards, to the detailed nuances of our millwork and truss operations, we pride ourselves on integrity, timeliness, efficiency, and quality. We’ve been around a while. In fact, we’ve been supporting builders and their communities since 1963. Founded in Englewood, Colorado by the Kurtz family, our company was created on the simple goal of providing unparalleled service to Colorado’s professional building community. And, as a 100% employee-owned company, that couldn’t ring more true today. Each one of us avidly works to support your needs, because as employee-owners, we genuinely care. From your specifications to our On-Time, In-Full delivery of superior products, our goal is to ensure your needs are met. Learn more about Alpine, Our Colorado Lumber Yards, (Including New Mexico Lumber Yards, & more at our home page.